One of the primary goals of the science of medicine is to understand human diseases and to devise cures. Presumably the most direct way of doing this would be to carry out experiments on humans. We could cut them up, try drugs on them and, nowadays, manipulate their genes using a variety of experimental paradigms. We actually do things like this, but to a very limited degree. Human dissection is limited to corpses, not live humans. Trials of drugs or therapeutic procedures on human beings can only be carried out within strict legal boundaries. Manipulation of the human genome is the latest frontier and its limits are being widely discussed. A cautious approach seems warranted. In other words, we are extremely conservative when it comes to what we can and cannot do to living human beings, which seems reasonable enough. In lieu of performing experiments on humans, we use animals. There are also many ethical concerns about doing this but the major argument that is usually put forward is that it is just the price we have to pay in order to develop cures for human beings. Unfortunately, this argument isn’t a very good one because things that cure diseases in animals rarely “translate” to humans. Every known disease has been cured many times over in mice but, as we all know, this hasn’t been achieved for human beings. More than 90% of new drugs that pass pre-clinical tests in animals, crash and burn in human clinical trials. Indeed, the results of animal experiments can actually be quite dangerous. Consider the recent fiasco over the effects of the drug BIA 10-2474, which was developed by the Portuguese pharmaceutical company Bial for the treatment of pain and other indications. The drug went through the usual battery of animal tests with a clean sheet. It was then given to humans and it proved to be horribly toxic. One person died and several others became extremely ill. The survivors all developed long term health issues. The problem was that the drug, which was developed as an inhibitor of the enzyme FAAH (fatty acid acyl hydrolase), produced other ‘off target’ effects as well, but these were only apparent in humans, not other animals. 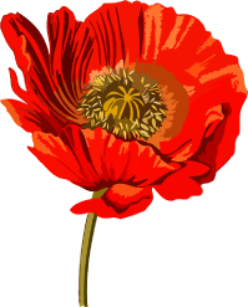 Consider the comments of a Dutch researcher who subsequently examined the effects of the drug. ”The off-target effects can be species-dependent, which could explain why studies in rats and mice did not identify the drug’s danger. But Bial could have known about the risk if it had thoroughly screened for off-target effects in human cells.” Indeed, if one wants to make secure conclusions about the effects of novel drugs on humans, one really needs to perform some of the most critical tests using human tissues. Moreover, nobody really wants to do experiments on animals. Most responsible scientists today subscribe to the guiding principles of the ‘3 R’s of animal research which are being increasingly implemented in new legislation where animals are being used for research (United States, Canada, United Kingdom and Europe). The 3 R principles, a set of ethical guidelines which aim to Replace the use of animals for scientific research, Reduce the number of animals used and Refine techniques to minimize the pain, suffering and distress caused to animals during scientific research. Given all of these considerations, it is not surprising that the scientific community is increasingly encouraging the development and exploitation of alternative approaches that may offer a more valid way of modeling diseases, disorders and drug interactions that don’t involve animals. Which brings us back to human beings. Throughout history we have struggled with the question as to what kinds of experiments we should allow to be performed on humans. It is interesting to consider how these questions have been answered throughout history. Things in the classical world were generally much more restrictive than they are nowadays and the dissection of corpses, for example, was not allowed. A corpse was considered to be a source of pollution and that anything that came in contact with it would be polluted by it. Stringent measures were taken to cleanse both the corpse of a deceased person or anybody who touched it. Corpses were kept away from holy shrines or from priests for fear of contaminating them. People who circumvented these rules could be severely punished. Doctors were also reluctant to cut into the skin of a living person so limiting the scope of surgery in the Greek world. Then something truly extraordinary happened in Alexandria in the early 3rd century BC when two Greek doctors, Herophilus and Erasistratus, made huge strides in our understanding of human anatomy and physiology. Founded in 331 BCE by Alexander the Great, who actually helped to design it, the ancient city of Alexandria was the purpose-built capital of Greek ruled Ptolemaic Egypt. The city acted as a key cultural link between the Hellenic world and the fertile Nile Valley. Ptolemy the Great had succeeded Alexander as the ruler of Egypt and associated lands resulting in a society which combined unique aspects of Hellenic and Egyptian culture. The Greek rulers of Egypt had considerable ambitions for making their empire the center of Mediterranean art and culture. The Ptolemies offered large stipends for supporting artists, scholars and scientists chosen according to their own personal tastes (this wasn’t a democracy!). The attitudes of Egyptian doctors as to the status of corpses and the pursuit of human anatomy were different from those of the Greeks. Probably for this and other reasons, Ptolemy rescinded the ban on the dissection of corpses. This would certainly have been viewed by many as a radical thing to do. However, there is good evidence that he went even further and allowed the vivisection of criminals who were destined for execution. For a brief period of time, from around 290 BC for about 40 years, it is said that Herophilus and Erasistratus made good use of these opportunities to carry out the first thorough survey of human anatomy. Although any written records detailing their efforts disappeared following the fire that destroyed the great library of Alexandria in 48 BC, we know quite a lot about their work from the subsequent writings of the Roman’s Celsus, Galen and the early Christian writer Tertullian. Among other things, Herophilus was able to make a great deal of progress in our understanding of both the cardiovascular and nervous systems, describing anatomical differences between veins and arteries, the ventricles of the brain, many of the cranial nerves, and distinguishing between the sensory and motor nervous systems. Then, just as suddenly as it had started, the opportunity for dissecting humans disappeared. Nobody knows why this happened although it has been speculated that the rising influence of Empiricist philosophers, who didn’t see value in the experimental program favored by Herophilus and Erasistratus, changed the intellectual climate in the city. Herophilus and Erasistratus’ subsequent reputation came in for a good deal of negative criticism when discussed by later writers, particularly with respect to their reported use of human vivisection. In On Medicine, Celsus states that ‘to cut open the bodies of men whilst still alive is both brutal and unnecessary’. One hundred years later, Tertullian went even further, labelling Herophilus a ‘butcher, who cut up innumerable human beings’ and accusing him of hating ‘mankind for the sake of knowledge’. Nevertheless, it is hard to deny the fact that Herophilus and Erasistratus had made a great deal of scientific progress based on their ability to dissect humans. And they weren’t the only ones. The great Greek doctor Aelius Galen , working in Rome in the 2nd century AD, wasn’t permitted to dissect live humans, so he let them do it to themselves. As the doctor in charge of the health of the Roman gladiators, he was in a position to examine the extensive wounds and injuries that gladiators inflicted on one another in combat. Calling them “windows into the body”, Galen took these as an opportunity for furthering his anatomical knowledge. The ban on the dissection of human corpses following the work of Herophilus and Erasistratus was not lifted until the rise of Italian universities some 1500 years later. The study of human anatomy was the finally taken up again by people like Leonardo Da Vinci and the great anatomist Vesalius whose monumental work in the 17th century finally brought the science of human anatomy into the modern era. The work of individuals such as Herophilus, Erasistratus and Galen illustrates the conclusion that the best way to find out about humans is to investigate humans. Nevertheless, as discussed above, our ability to do this has been very restricted for sound ethical reasons. The major alternative to this is to perform experiments on animals. These are used as “models” for humans and results from these studies are extended to humans by analogy. A great deal of useful scientific information has been obtained by performing experiments from animals ranging from organisms as simple as a fly or worm to those as complex as a monkey. However, the problem comes with attempts to extend studies on animals to humans in the sphere of therapeutics. As mentioned above, results obtained using animals often do not accurately reflect the situation in humans. So, how do we free ourselves from this quandary? An answer to this question has recently started to gain considerable traction in the scientific literature. The experimental approach in question is actually nothing new but has been greatly enabled, like so many other things these days, by the study of stem cell biology. The meaning of the term “stem cell” is a little bit fuzzy, but basically refers to a cell that can turn into many other kinds of cells. A good example of this would be a fertilized egg or “zygote”, which, following many cell divisions , turns into all the different types of cells that make up an entire animal. Indeed, cells from an early embryo retain this ability. Once a blastocyst forms, cells taken from the inner cellular mass can still go on to produce an entire animal. Such cells are known as embryonic stem cells (ESCs). As the tissues of an animal begin to differentiate, stem cells taken from their developing tissues usually retain the ability to produce all of the cells of their particular tissue of origin but, because of different types of regulation of gene expression, lose their ability to produce all of the other cells of the animal. Eggs and sperm cells, which are known as germ cells or gametes, are an exception to this. Nevertheless, because all cells contain the same complement of DNA it was hypothesized several decades ago that, if controls on gene regulation could be reversed, mature cells from different tissues should still possess the potential to become stem cells once more and produce all of the cells that make up a complete animal. John Gurdon working at Cambridge University in the 1950s was the first to demonstrate that this was possible by taking the nucleus out of an adult frog cell and transplanting it into an egg, allowing it to develop into a complete frog. This type of research eventually resulted in the procedures that produced Dolly the sheep and other cloned animals. Even human embryos can be produced this way but they have never been allowed to develop to full term and result in fully functioning humans. In another series of experiments a team of Japanese scientists led by Shinya Yamanaka was able to take an adult cell such as a skin fibroblast and, by manipulating its gene transcriptional program, allow it to return to its stem cell state. 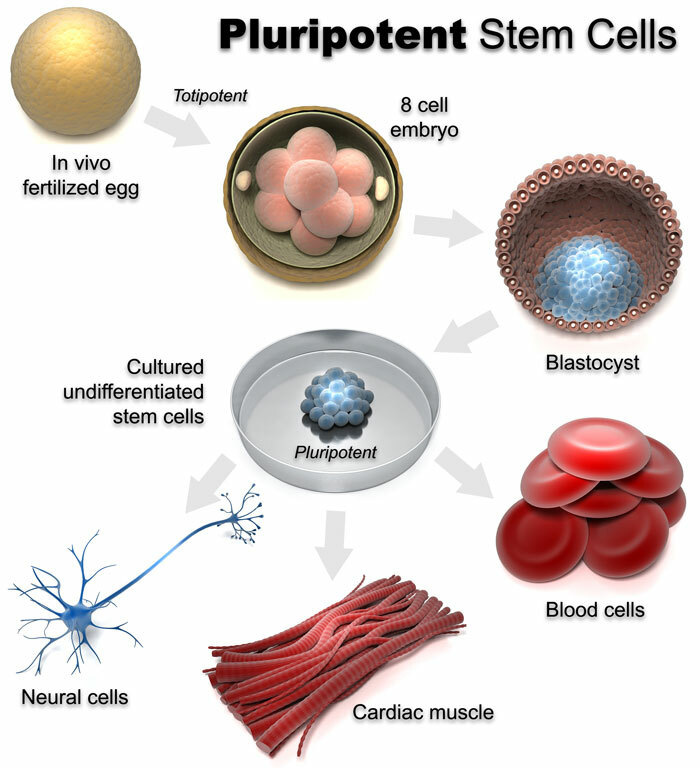 Such cells became known as induced pluripotent stem cells (iPSCs), which could then be used to generate all the tissues of an organism. So, at least theoretically, human stem cells could be used to generate human tissues or even complete humans. At this point in time nobody has reported using stem cells to generate entire living human beings. If they did there would be many things to debate. What would be the status of these people? Would they just be used for harvesting tissues for human transplants as described in Ishiguro’s novel “Never let me go”? Religious people have raised the question as to whether they would have “souls” –and so on. Producing live humans is one thing. However, how about human organs? If stem cells could be coaxed into making genuine human organs these might be used for repair purposes or for the testing and development of therapeutics that were actually directed to humans rather than animals. Can such a thing actually be achieved in practice? Back in the 1950s several investigators began to perform experiments where they would dissociate tissues into their component cells, mix them up and put the resulting cells into cell culture, a common technique for keeping cells alive for an extended period of time in an artificial environment. What they often observed was that the cultured cells didn’t remain as a random mixture but began to sort themselves out to form a 3-dimensional structure that looked something like the tissue that they had been originally isolated from. Although this was an interesting observation and had some important theoretical implications for the ways organs normally develop, the technique wasn’t widely used as an approach for producing new drugs for treating human disease. But with the development of human ESCs and iPSCs things have started to change. Nowadays there is a good deal of information about the types of biological “growth factors” that are able to “instruct” ESCs or iPSCs so that turn into one particular type of tissue rather than another as they do in an intact embryo. Hence, if iPSCs are made from an individual and treated with the appropriate growth factors they can be made to differentiate in cell culture to produce the major cell types found in a particular organ. These cells will then sort themselves out to produce 3D structures that look very much like human tissues. These structures are known as “organoids”. Success has been achieved in producing a large number of organoid types including intestinal, kidney, retinal, pancreatic, and liver organoids. 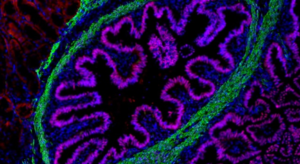 Even tissues as complicated as the brain appear to form complex organoid like structures. Brain organoids can be produced that resemble an entire brain or just a part of it such as the cerebral cortex. The idea is that organoids can now be used for drug development and other procedures which are not only specific for humans, but individual humans at that. For example, because the kidney plays a key part in drug metabolism and excre­tion, a kidney organoid could be useful for testing drug candidates for toxicity before they reach clinical trials. And researchers speculate that other human organoids, such as heart and liver, could similarly be used to screen drug candidates for toxic effects — offering a better read-out on the response of a human organ than is possible with standard tissue culture or animal testing. Gut organoids should prove to be a powerful tool in personalized medicine allowing scientists to study the effectiveness of drugs in people with cystic fibrosis, who have genetic defects that affect ion channels and disrupt the movement of water in and out of the cells lining the lungs and intestine. Researchers can take rectal biopsies from people with the disease, use the cells to create per­sonalized gut organoids and then apply a potential drug to see if it will reverse the symptoms of the disease in that particular individual. Organoids have already been used in some important scientific investigations such as understanding the pathological actions of the Zika virus (ZIKV). Zika virus infection of humans was first identified in 1952. The infection is spread by mosquitoes and the resulting illness in adults is typically mild with fever-like symptoms that last for a few days. However, in 2016, ZIKV was declared a public health emergency by WHO based on observations that there was an association between babies born with small brains (microcephaly) and ZIKV infection. Because, there was no suitable model for studying ZIKV infection it was modeled in stem cell derived brain organoids designed to resemble cerebral structures. These experiments were a great success. ZIKV infection was found to cause a reduction in the proliferation of infected neural progenitor cells and an increase in their death, something that was responsible for the development of abnormally small brains, one of the most obvious symptoms of ZIKV infection in children. It was also observed that the infected organoids upregulated expression of the innate immune receptor TLR3 (toll-like receptor3) which was responsible for producing the observed dysregulation of the birth and death of nerve cells. This suggested that a drug that blocks TLR3 might be therapeutically helpful in treating ZIKV infection. Organoids have also been used to model the effects of other viral and bacterial pathogens including Norovirus, and clinical strains of Rotavirus, two viruses that were difficult to cultivate and study until organoids became available as a tool. Of course, organoids that resemble tissues like the brain are certainly incomplete because, although they contain neurons and glia, they don’t contain cells like microglia and they also don’t contain blood vessels. Recently, however, it has been demonstrated that a human cerebral organoid can be transplanted into the brain of a mouse where it will survive and become vascularized by mouse blood vessels. Experiments such as these illustrate an approach which allows human organoids to be transplanted into animal hosts such as pigs, where they can mature prior to being harvested for transplant purposes or for studying the mechanisms involved in the development of human diseases. 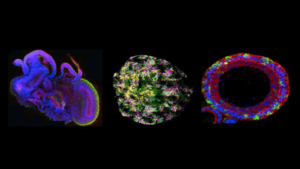 For example, organoids have been grown from patients with autism or schizophrenia in an effort to determine what problems occur when the brains of these individuals develop. Bioethicists have already started to worry that if brain organoids become too sophisticated they may develop some form of intelligence. If they do, how should the law view them? Will they qualify as “persons” and be covered by laws protecting “personhood”? All of this may seem premature but in some experiments investigators were able to record brain activity following the simulation of the eye cup regions of brain organoids with light. By combining the organoid method with recently developed gene editing techniques such as CRISPR, researchers can now also introduce all types of genetic changes into the stem cells used for generating organoids , allowing them to assess the role of individual genes and the impact of specific mutations on the development of tissues or their response to drugs. Techniques such as these are helping to usher in the prospect of an approach to medicine that is tailored to address the needs of an individual rather than an entire population. The field of organoid research is really a very promising, introducing the prospect that, for the first time since ancient Alexandria thousands of years ago, we might be able to perform important experiments on live human tissues without having to resort to human vivisection or the use of animals. Nevertheless, just like other fields of medicine this one will surely have its own ethical problems to deal with. Bioethicists and others are already trying to raise our consciousness about how to handle a situation which is developing extremely quickly –to be forewarned is to be forearmed.